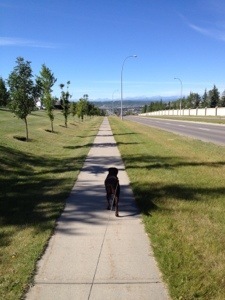 Today started with a supah long walk with Layla. Followed by a generous portion of eggs benedict, courtesy of my other half. Apparently those two things pooped out my lil family. I planned on working out, but I can’t blast my music while those precious gems are catching some zzz’s. So, rather than letting time waste, I did 200 situps on the stability ball. 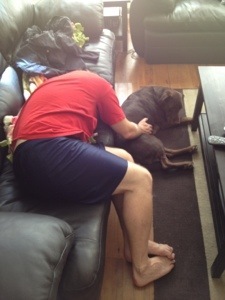 Once they wakeup, I’ve got some sweet strength circuits lined up. Guess what? Athena blogged about my bachelorette party! You should check it out here. Guess what else? I weighed myself this morning and I am .4 lbs UNDER my ideal weight. I jumped for joy for so long, I probably lost another .2 lbs. I am hoping this super drop in weight isn’t solely attributed to my trip bak to the states, so I’m gonna have to really look at the differences in my eating/exercise/daily habits so I can stay on track. Not that I’m all about the number, but I have been working really hard lately, and me feeling good, accompanied by a lower number on the scale is a pretty dang good feeling. Anyone else feel this way? Pretty laid back Sunday in this household. My family is snoozing, and I’m sitting in the sun drinking my [new low] weight in water. 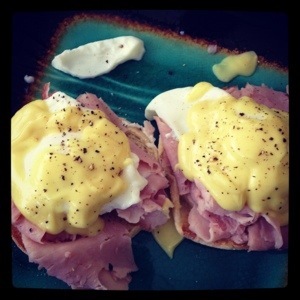 Ahhhh eggs benny ❤ THE BEST!